Each evening, guests attending ‘Dinner in the Great Hall’ will be greeted on arrival with welcome drinks and canapés before stepping through the doors of the wizarding school into the Great Hall, which will be completely transformed for Christmas. 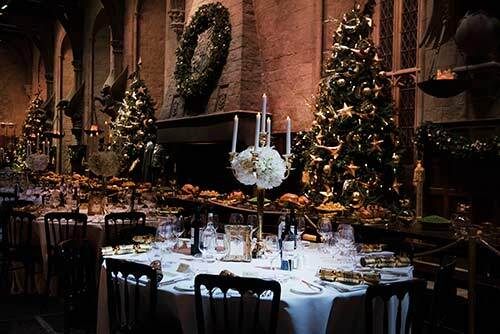 Decorated using the original props from the magical film series, the Great Hall will be lined with trees adorned with golden baubles shaped like moons and partridges, while a replica feast complete with flaming Christmas puddings will dress the long tables. After walking the red carpet, you will then take your seats on the actual set that was used during filming before enjoying the first two courses of a delicious Christmas dinner with all the trimmings (special dietary requirement options also available*). After dinner, you will be able to explore the Studio Tour in its entirety, admiring sets such as the Gryffindor common room and the Weasley’s kitchen from The Burrow, both of which will be dressed as they were for winter scenes in the film series. A selection of festive dessert bowls will then be served on Platform 9 ¾ right next to the original Hogwarts Express locomotive. A refreshing glass of Butterbeer will be provided in the backlot café and you will then have the opportunity to walk up the wizarding shopping street of Diagon Alley, before taking in the breath-taking Hogwarts castle model (covered in a layer of filmmaking snow especially for the festive season). The snow is hand-sprinkled onto the majestic model and is made from a combination of paper and salt – chosen because it clumps like real snowflakes and catches the light like ice. The evening will conclude with music and dancing, with a bar provided for those who wish to purchase additional drinks. The Studio Tour’s ‘Dinner in the Great Hall’ events will take place on the 10th, 11th and 12th December from 6pm until midnight and are open to over 18s only. Guests will be seated at tables of 10 or 12 and tickets are priced at £240pp. Tickets will go on sale on Tuesday 25th September at 10am and be available to purchase online here. *Other dietary requirements can also be catered for and guests will be asked to provide this information during the booking process.